“Conducted in parallel with the extremely dangerous phenomenon of ‘state capture’, the process of consolidating our democracy is endangered by “media capture” and the incremental obliteration of critical voices.” – Helen Zille in an open letter to Dr Iqbal Survé in January 2015. ‘Because the editorial independence of Independent Media does not exist – it sits in the hands of Iqbal Survé. Anything he says he wants to be published, will be published.’ – Former AYO executive Siphiwe Nodwele at 1 hour 22:42 of his televised testimony before the Lex Mpati commission of inquiry into the Public Investment Corporation. Most people will have read brief newspaper summaries of the evidence of former AYO executives Siphiwe Nodwele and Kevin Hardy at the Mpati commission. They were hired in December 2017, shortly before AYO Technologies listed on the JSE and, eight months later resigned along with four other board members. 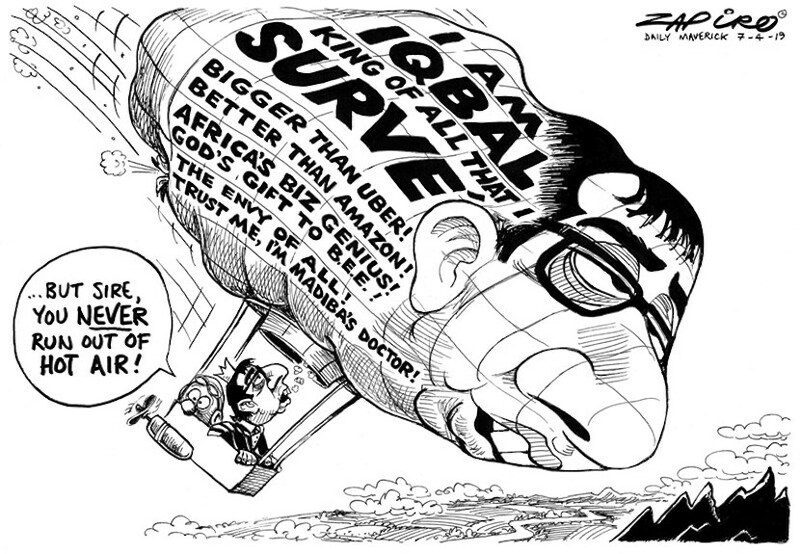 The question which goes to the heart of Iqbal Survé’s credibility is his under-oath testimony before the commission in which he asserted that he does not interfere in the editorial processes of the newspapers he owns and that he regards the autonomy of his editors as inviolable and sacrosanct. I have already articulated my belief on this website that he misled the commission in this regard and I believe that the submitted statements and on-camera evidence of Nodwele and Hardy support my contention. The perjury on this question is self-evident. Survé on the one hand and Nodwele and Hardy on the other, can’t both be telling the truth. To make the evidence of Hardy and Nodwele on this question available to anyone who has internet access, I have incorporated relevant segments of their statements in this article and transcribed apposite sections of their testimony from the SABC’s live-streamed television coverage which is available on YouTube. Whenever there were negative news articles, Iqbal insisted that AYO put out a counter story to change the narrative through his papers. Media articles would be written by Feroza Petersen, an AEEI marketing manager in conjunction with Khalid Abdullah. All emails in this regard would usually have Iqbal or his executive assistant Maude copied. An example of this was the AYO Technology and Incubation Hub which was a bone fide idea of Kevin’s to transform the sector through supporting young black entrepreneurs. However, as a ploy to change the negative media attention on the company; an article was hastily put together titled “Unions’ investment in AYO Technology prepares their sectors for a digital future” and published on the front page of the Business Report on or about 27 March 2018. The report duly appeared on 27 March 2018 as Nodwele testified. The blatant lie is contained in the ‘Staff Reporter’ by-line. It was not written by a Sekunjalo Independent Media reporter or even Adri Senekal de Wet, it was written at the behest of the newspaper owner by senior executives with, as Nodwele testified under oath, Survé’s input and signoff. Nodwele specifically mentions AEEI marketing manager Feroza Peterson as the anonymous author of these ‘Staff Reporter’ articles but, according to him, this apparently fraudulent abuse of the Independent Media newspapers to mislead investors and the public carries the sole imprimatur of Iqbal Survé. Does this not, on its own, give the lie to Survé’s under-oath claim that he does not interfere with or seek to influence editorial decisions on what appears in his newspapers and on the online IOL portal? And would this not support my subjective belief that he perjured himself in this regard when he testified before the Mpati commission on the 2nd and 3rd of April? At the conclusion of Nodwele’s testimony, commissioner Emmanuel Lediga thanked him for the significant detail contained in his written statement and that of Kevin Hardy. Both have stellar business CV’s, impeccable career records and were credible witnesses. A quaver comes into voice of Hardy – MD of British Telecoms SA before he joined AYO – as he wraps up his testimony and, in thanking his wife for her support during an emotionally-taxing period of his life, he wipes a tear from his eye. There’s a message there about the cost of working for Iqbal Survé and one gets an idea of why acclaimed journalists and columnists like Tony Weaver, Janet Heard, Chris Whitfield, Ann Crotty, Wendy Knowler, Makhudu Sefara, Max du Preez and others chose to leave shortly after the PIC-funded Sekunjalo takeover of Independent Media. And why the staff exodus has not stopped since then. Siphiwe Nodwele: …but for them to continuously lie to use their papers to slander us on a daily basis and knowing full well we don’t have a hundred titles across the country, we’re defenceless when it comes to this. And that is one of the reasons we are here: to defend our names, to clear our names, to say we are professionals, we are proud of the job we did at AYO and we won’t be disrespected by the likes of Dr Survé. Lex Mpati: Finally, do you think that the company uses its media platform to promote itself or to do other things; is there some editorial independence in the newspapers and the media platform? Siphiwe Nodwele: Thank you chairperson. I think to answer that question, let me take a step back to the original board of AYO on listing. You had three non-executive directors that were Independent Media employees, and these are supposed to be independent non-executive directors. Subsequent to that you’ve got Takudzwa Hove who is the Chief Financial Officer of Independent Media who sits on the board of AYO Technologies, you’ve got the Executive Director for HR of Independent Media who sits on the board of AYO Technologies, you’ve got all these people who are Independent Media people and of course the CEO, Mr Howard Plaatjies, is the Digital Head of Independent Media who is now the CEO of AYO Technologies. So given this very close relationship between the two, it was very easy for Dr Survé and Mr Abdullah, or whomever joined the group to say: “Guys we need an article to come out, this is what the article should say, this is what people should be quoted.” So, an example is a guy like Dennis George for instance, he’d be called after the article has been written to say: “We’re going to attribute these quotes to you”. Kevin Hardy can speak for himself, how when the BT transaction was announced, he was quoted as having said that 600 people would be coming across. Now firstly, that was factually incorrect – only 50 people were going to come across from BT. But because the editorial independence of Independent Media does not exist it sits in the hands of Dr Iqbal Surve; anything he says he wants to publish, will be published. And again, we’ve been victims of that, given our stance and inability to play ball as they would like us to. Lex Mpati: But I mean don’t you have professional journalists there and the editors and all those professionals? Siphiwe Nodwele: Mr Chairperson, without going into detail of the staff profile of the Independent Media group, because I’m not familiar with it, I’m sure there are good men and women in there. The same as there are good men and women at AYO, but the factual reality is – all power sits with one person. And even though you have good people in there, I’m sure for their jobs and livelihood, they will toe the line as per Dr Surve’s wishes. In early July, in a phone call from Dr Survé, it was suggested that consideration should be given to consolidating some of the ICT skill in the group and he thought it would be a good idea to move the independent ICT staff into AYO. I asked how many people that would involve and I was told in the region of 6 people. I said l would look into it and have a discussion with Mohammed who was lNL at the time. Takudzwa Hove and Howard Plaatjies then setup a meeting to come and see me to discuss this in JHB. Mr Hove tried to convince me that this would be a good idea, and when he could see I was not budging he asked if we could excuse the rest of the meeting attendees as he needed to discuss something with me. l said l was happy to but that Siphiwe would stay with me. Mr Hove then proceeded to suggest that the reason we should do this was that we were part of the family, and the reason AYO existed was because of Independent Media and that we should support the move of staff. He also suggested that there was trouble coming for Independent Media and that they urgently needed to move the strategic assets of Independent to different Sekunjalo entities. We assumed at the time he was referring to creditors calling on the assets. l refused to budge on the issue and instructed Naahied not to progress with the request. Subsequently, I was informed that the 20 staff were moved into the AYO payroll post our departure. “Looking back at the time there was not much media coverage other than in Dr Survé’s newspapers. This would prove to be a trend where his newspapers were used as a mouthpiece for the group. Often instructions would be given to Adri Senekal de Wet to get articles done”. Given this under-oath testimony by Kevin Hardy, the must-ask question is: Where does this leave Adri Senekal de Wet? Hardy describes her as a propaganda peddler, waiting for instructions from Survé on what to write. She has called for those who propagate unethical or fake news to be prosecuted but failed to respond to the questions I put to her in this regard. The evidence is growing that Iqbal Survé perjured himself when he told the Mpati commission that he does not abuse his power and influence as the owner of Sekunjalo Independent Media to dictate to the editors – dependent on him for an income – what they are permitted to write and what they are allowed to publish. We have the investigative reporting of Ferial Haffajee who was told by Survé’s current and former employees that he gets his CEO, Howard Plaatjies to pass his editorial commands on to his news staff. Plaatjies did not respond to Haffajee’s Whatapp questions in this regard and one has to ask why. We now have the under-oath testimony of Siphiwe Nodwele that Editorial independence does not exist at Independent Media backed up by the supporting evidence of Kevin Hardy. We have, as further proof of Survé’s interference in news coverage, his dismissal of Cape Times editor Alide Dasnois and of Sunday Independent editor Wally Mbhele and the termination of Asad Essa’s weekly column because they had offended Survé himself, his political overlords or his Chinese financial backers. Survé needs to be recalled by the Mpati commission to respond to the disturbing claims by Hardy and Nodwele, but has the time not come for Adri Senekal de Wet and Howard Plaatjies to voluntarily appear before the Mpati commission and, in the absence of that, to be subpoenaed? What also comes through in Kevin Hardy’s testimony is the acknowledgment by AYO board member Takudzwa Hove that, far from ‘flourishing’ and realising Survé’s grandiose ‘vision’ and ‘building a media legacy’ and ranking among the ‘global best’, Independent Media is not only divisive in line with the owner’s ethnic antipathies, but in dire financial straits. He also suggested that there was trouble coming for Independent Media and that they urgently needed to move the strategic assets of Independent to different Sekunjalo entities. We assumed at the time he was referring to creditors calling on the assets. Hove must have been aware back then that Surve had decided to renege on his obligation to pay back the PIC/GEPF loan which he used to buy the Indy newspapers and to demonstrate his philanthropy by repaying his Chinese moneylenders instead. Survé’s problem is his ego – and his loyalty to those who stroke it for him. No one can tell him anything because he believes he knows everything. When he wasn’t damning his critics as anti-transformation racists, he was beaming out from the pages of his own newspapers or commissioning his most prostrate toadies to write odes to his mastery of the wind and conquest of the sun. It was astonishing, even awe-inspiring at times. Some people take selfies when they’re feeling insecure or vain. This guy bought an entire media company to do it for him. The trouble is, he bought it with borrowed money he can’t pay back. What the past 25 years have taught us is that when an ANC acolyte gains control of a news organisation, the organisation becomes a piggy bank, white staff are persecuted and purged, propaganda becomes the product, censorship by omission the prevailing norm and every effort is made to avoid news coverage accountability. The privileged few, however, laugh all the way to the bank. There is also, as Helen Zille points out in one of the anchor quotes to this article, the ‘incremental obliteration of critical voices’. This became known as ‘Mulholland’s Law’. That was then – but the script has changed. Now we watch on live-streamed television how defamed and demeaned former employees like Siphiwe Nodwele and Kevin Hardy experience the cathartic healing of being able to tell the country what it was like to work for Iqbal Survé and how they perceived his business strategy. More than a hundred top editors, sub-editors, reporters, photographers and columnists, driven out of Independent Media at Survé’s behest, watch those broadcasts with an equally cathartic measure of schadenfreude. We await the testimony of the already-compromised Dr Dan Matjila. What will his evaluation be of the Sekunjalo Independent Media tragedy and the concomitant evisceration of a once-respected newspaper company? Will Matjila be able to refute the damning testimony already in the public domain? And what will the result be of a JSE demand that AYO Technologies subject its financial records to independent scrutiny? In yet another blow for the beleaguered Public Investment Corporation, Dewald van Rensburg reports in City Press that its AYO shares, bought for R43 each, are now valued at R14.50 but are effectively worthless because nobody wants to buy them. Iqbal Survé has denied any knowledge of or role in AYO massaging its interim financial results. The company, which has repeatedly accused Nodwele and Hardy of malfeasance, has denied their allegations and promised its full co-operation in responding to them and to the concerns expressed by the JSE – see here and here.